Welcome to the art of Atarashii Naginata , as practiced in the Northern Virginia Tendokan , a branch of the Capital Area Budokai. Our instructor, Fran Vall, is a student of Tendo Ryu Naginatajutsu and president of the East Coast Naginata Federation . Naginatajutsu is a fulfilling tradition, practiced by both men and women. It combines the traditional forms - or kata - with actual sparring. We invite people of all levels and skills to join us in practice. There are also several annual events that rotate between the Washington-Metropolitan area and New York City where the entire federation is invited to attend. If you are interested in more information, contact us. The naginata is perhaps the most famous polearm of Japan. It was used by the buke - the warrior class of Japan - for centuries. It became part of the traditional progression of an ancient battle, surpassing the sword as the weapon of choice for men in large scale combat. Women learned its use to defend the home and castle. The original characters for the naginata meant 'long sword' because the blade is made in a fashion similar to the tachi and katana, although it has developed its own characteristics over the centuries. Like all polearms, the metal head is attached to a long body of wood - perhaps 2 meters or more in length. Its length added reach and leverage, making it deadly against horsed and armored opponents. During the peace of the Tokugawa shogunate, it became the traditional weapon of women, and was often part of a samurai daughter's dowry. There are many traditional ryuha that still teach the old naginata kata, using wooden naginata, just as kenjutsu schools might use a bokuto. One of the more famous is Tendo Ryu Naginatajutsu - the Naginata techniques of the Tendo family school. Tendo Ryu Naginatajutsu grew up alongside of the sword arts of Japan, and was taught under the All Japan Kendo Federation for many years. 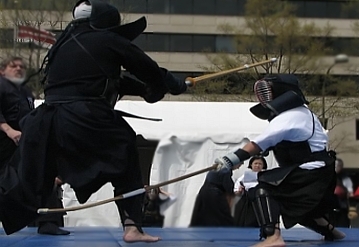 Using kendo-like equipment, and a bamboo-bladed weapon, tournament matches may be held. This 'new' form is called 'Atarashii Naginata ', and has grown large enough to have its own international federation. Atarashii Naginata is rare in North America, with barely 100 ranked practitioners in all of the United States, spread between California, Colorado, Illinois, New York, and the Washington DC metropolitan area. For more information on studying naginata, please contact Raymond Sosnowski at naginata@capitalareabudokai.org.